Set in modern day Dublin, ONCE tells the story of Guy, an Irish musician who has given up on his music—and his love—and Girl, a Czech immigrant who inspires him to dream again. Over the course of one fateful week, their unexpected friendship and collaboration evolves into a powerful but complicated romance, heightened by the raw emotion of the songs they create together. ONCE is based on the 2007 Academy Award-winning film of the same name, written and directed by John Carney, and starring Glen Hansard and Markéta Irglová, who also wrote the original music and lyrics. The stage adaptation is brought to life by an award-winning team of visionary artists: book by award-winning Irish playwright & screenwriter, Enda Walsh (Penelope, Hunger, The New Electric Ballroom); direction by the acclaimed Scottish director of Black Watch, John Tiffany; movement by Steven Hoggett (Black Watch, American Idiot); and music supervision and orchestrations by Martin Lowe (Mamma Mia!). The set and costume design are by five-time Tony Award winner Bob Crowley (The Coast of Utopia, Mary Poppins), lighting design is by Tony winner Natasha Katz (Aida, The Coast of Utopia), and sound design is by Clive Goodwin. ONCE was originally developed at the American Repertory Theater (Cambridge, Massachusetts) in April 2011. A developmental run of ONCE played in November 2011 to January 2012 at New York Theatre Workshop. ONCE opened on Broadway on March 18. 2012, produced by Barbara Broccoli, John N. Hart Jr., Patrick Milling Smith, Frederick Zollo, Brian Carmody, Michael G. Wilson, Orin Wolf, The Shubert Organization and Executive Producer Robert Cole, in association with New York Theatre Workshop. The production won eight Tony Awards, including Best Musical. It also won Best Musical from the New York Drama Critics’ Circle, Drama Desk, Drama League, Outer Critic Circle and Lucille Lortel Awards. The original cast recording won the 2013 Grammy Award for Best Musical Theater Album. ONCE is currently running in London’s West End at the Phoenix Theatre (now in its second year). The national tour is playing across North America and the show’s Australian premiere begins in October 2014 in Melbourne. Future international productions are also planned. We are long overdue in taking in a non-traditional love story. Honestly, I’m over ‘The Notebook’s’ romantic aesthetic. Perhaps, it’s not about subscribing to the romantic fairy tale anymore. A lot of us aren’t living the norm when it comes to love and relationships these days. Perhaps we may have had some close misses in our personal histories. Participating in a different love narrative that speaks to our truth is important. 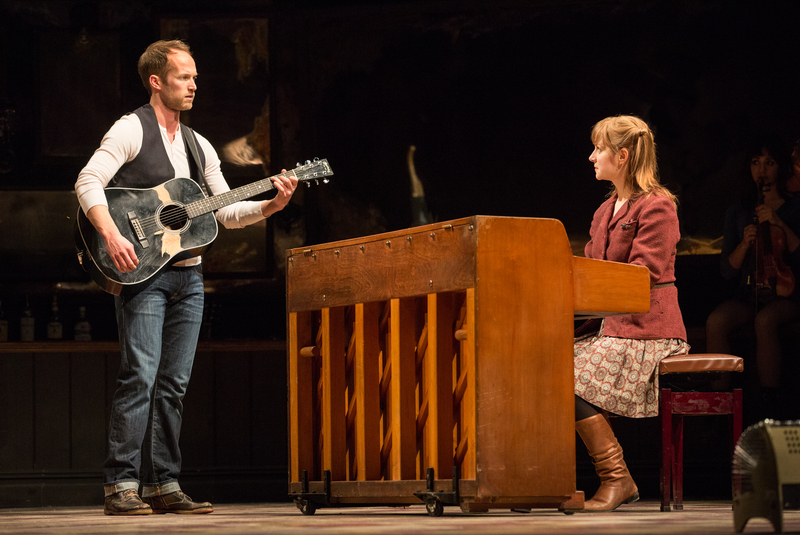 That story can be experienced in Mirvish’s production of ONCE. The theatrical debut of ONCE at The Ed Mirvish Theatre in Toronto which will run until May 31, 2015 and will guarantee to give you the texture the film wishes it could convey through screen. The Mirvish production of ONCE is full of aches, pains, love sickness, dread, euphoria and utter joy. How can one not get let lost in its romantic ambiance within the aisles of The Ed Mirvish Theatre which once gave us the Phantom of the Opera years ago. The ghosts of that production are deeply embedded within the woodwork of The Ed Mirvish Theatre. The Ed Mirvish Theatre began its life in 1920 as a combination vaudeville and motion picture theatre in the Pantages theatre circuit. With its original 3373 seats, it was the largest cinema in Canada and, with its lavish interior – designed by the great theatre architect Thomas Lamb – the most elegant. Think swooping balconies, lush draperies, an ornate ceiling fit for a Queen and seats so lush I wish I could have taken mine home – set the stage for our evening. Upon taking our seat and having a pre-drink on the stage – we were slowly lulled into an upbeat pre-jam session with the cast’s musicians. As our fellow audience members gently began to leave the stage the band continued with a rousing Celtic session to get our knees popping and feet stomping in our seats. We instantly felt like we were in Ireland, smelling green grass in the spring and the warm familiarity of an authentic Irish experience. The stage was outfitted in the scene of an Irish pub. A large mirror that broke down the fourth wall, a gorgeous wooden antique bar and a floor that had seen better days but held stories of spilled pints, scuff marks from energetic dance sessions and chips from emotionally ridden interchanges. As the performance unfolded we were introduced to Ian Lake who plays ‘Guy’. A dreamy ‘Guy’ with all the makings of Hansard but with a more boyish charm. Lake’s seasoned experience from Stratford and the National Theatre School of Canada under his belt – gives a performance that is heartwarming but riddled with confusion and a rolling sadness. The audience bears witness as he struggles to come to terms with something he was looking for all along and is now in front of him. But as the universe (that has the best of sense of humour during the worst of times) reminds us that he may have to walk away from a love for another now an ocean away. ‘Girl’ played by Trish Lindström brings us a performance that is full of raw emotion, a different kind of love narrative and complicated baggage. Her cultural thread at first may seem to be the clash of the titans for Dublin but ends up being quite like minded. I appreciated the Czech language translation on an overheard screen which added to the authenticity between fellow actors playing revolving Czech roles as they interacted with ‘Girl’ in English. 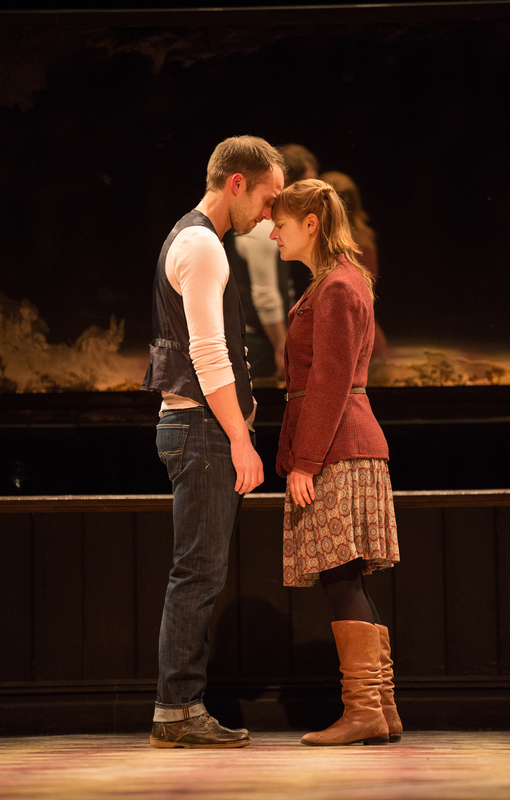 Throughout ONCE’s performance we were given some intimate interludes between ‘Guy’ and ‘Girl’. Moments riddled with knowing glances, a joyous repose and intimacy that could have been rendered within the confines of a bedroom. These moments make ONCE special and not like any musical theatre in the city in this moment. There were moments of modern dance by participating band members whose presence on the stage was effervescent. From a slow hum, to notes of Irish drink, rousing dance parties and low rumblings felt through voice and instruments made for truly organic performances. This entry was posted in Uncategorized and tagged 2015), art, musicals, once, ONCE at The Ed Mirvish Theatre in Toronto (February 10 - May 31, plays, toronto, toronto theatre on March 15, 2015 by thirtyfourflavours.